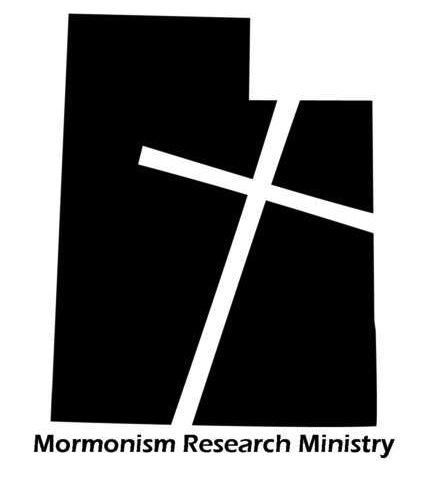 Again, since, Bill McKeever and Eric Johnson have done the most thorough analysis of all the errors in Mr. Olson’s article in their 10-part (approximately 110 minutes in total) Viewpoint on Mormonism audio series, I wanted to make sure that the links to those shows didn’t get lost in the text of the article. I simply can’t stress enough how important these shows are in demonstrating how errant, uninformed and obviously over his head Roger E. Olson clearly was in his article! Ok, just for the record, whenever you read an article by some Evangelical scholar claiming to be “meeting with LDS scholars” and announcing that Mormonism is moving more toward Evangelical Christianity you may safely ignore it. The meetings being referred to represent a long term, carefully gate-kept, PR managed sequence of meetings that have persuaded Evangelicals that Mormons are just like them. Many years ago one of the Evangelical participants told me that the LDS Scholars and the Evangelicals are at one on Paul’s doctrine of Justification by Faith. Yet even then it was conspicuously untrue, and could be shown to be such in from the writings the very LDS scholars the evangelical was listening to were producing at the time. Never mind the fact that the private opinions of LDS scholars are not strictly speaking representative of what he LDS Church teaches through its prophetic leadership, its general authorities, and its correlated church published materials. I have noticed that these meetings are sometimes as frustrating to LDS folks in Utah as they are to Utah Evangelicals. Did it ever occur to anybody that Mormons who have no interest in becoming more like evangelicals, may not like always having to be told that they are becoming so, when they know for a fact that they aren’t? Anyhow, claims of the sort made here are regularly made by evangelical participants of the “dialogue,” but never substantiated. 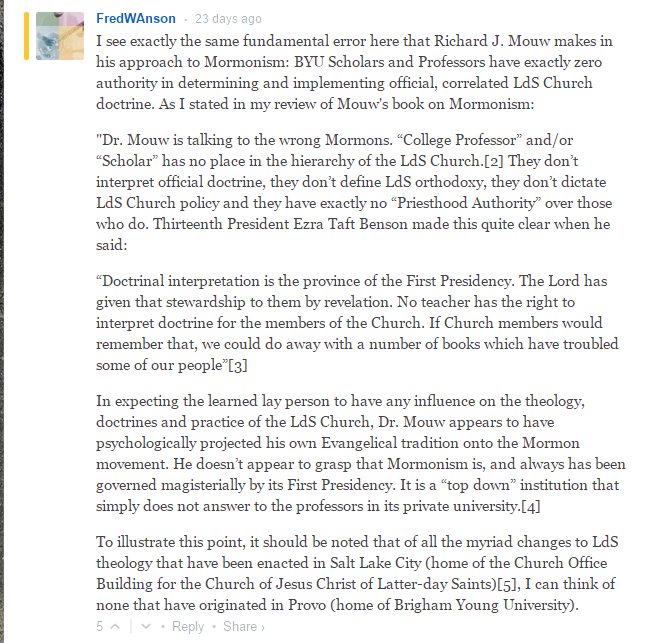 I have no objection to Mormon and Evangelical scholars having private meetings if they want to. I do object to them doing so and then making false claims about changes in Mormonism, without ever being willing to either put up or shut up. If you are going to claim ecumenical progress, then lets see a document that gives us something concrete. 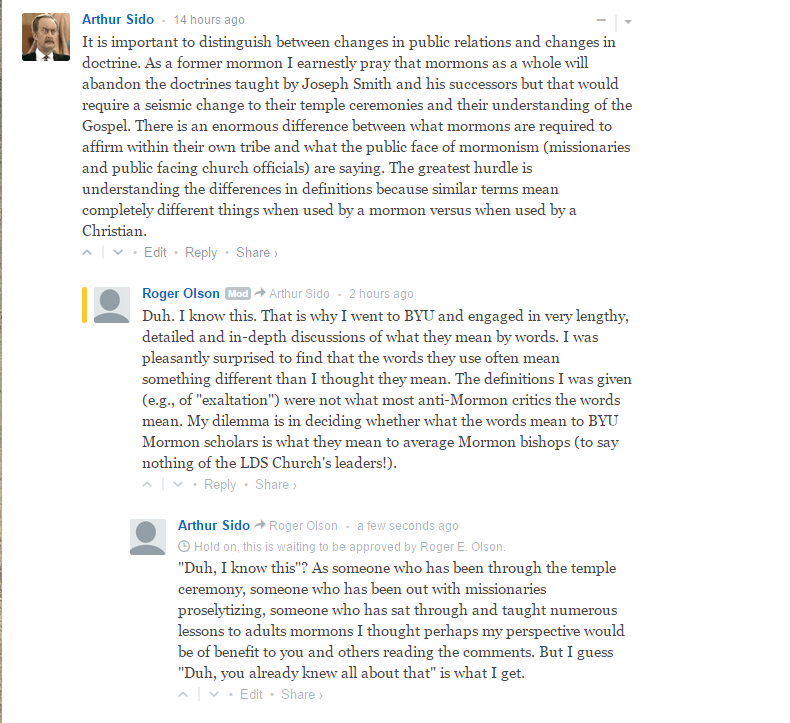 The dubiousness and dishonesty of some of the principle gate keepers and managers of this “dialogue,” was a matter of constant consternation to me during the nine years that I was a professor of Historical and Theological Studies at Salt Lake Theological Seminary. For a response to an earlier example of this kind of thing see my article here: http://www.etsjets.org/files/JETS-PDFs/49/49-3/JETS_49-3_549-568_Huggins.pdf. Final word to all the Evangelicals who have been playing along with this for so many years: Wake up and cut the crap! Ok, then, I have officially vented my spleen!